“Last week on the BBC – and you should go through the transcript – Eric Pickles, the chairman of the Conservative party, explained without a hint of shame that we should not condemn one of their new allies, the ‘For Fatherland and Freedom’ party, who every year celebrate the Latvian Waffen SS with a march past of SS veterans, because ‘they were only following orders’. “And you know what makes me sicker? No one in the Tory party batted an eyelid. “What do they say? All you need for evil to triumph is for good men to remain silent. 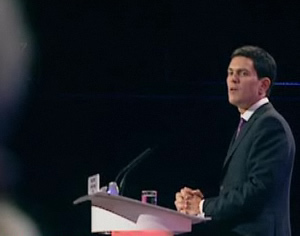 Hard hitting stuff from @DMiliband at #Lab09. Are the Tories really comfortable with their new friends: http://bit.ly/ZFmbu ? If we look at the evidence from Latvia, it appears many people commemorate the “Latvian Legion” as some sort of bulwark against Soviet oppression. See http://www.reuters.com/article/worldNews/idUSTRE52F3UB20090316 for more. I don’t think the commemorations are anti-semitic, they are just anti-Soviet/pro Latvian. Although if someone wants to post details of more sinister acts, please do. Similar things happened in several European countries, unlike Britain they had to choose between brutal fascism and totalitarian socialism. British should think twice before pointing the finger at others. It wasn’t long ago Britain unveiled a statue to Bomber Harris, architect of “carpet bombing”, in London. A quick visit to Wikipedia reveals a single night’s raid by the RAF on Dresden alone claimed the lives of “several tens of thousands of civilians”. I’d hope someone like Milliband – he’s well-educated – would understand the subtleties of European history instead of trying to score cheap points. Personally I am disgusted that a Foreign Secretary of this country feels it proper to comment on other nations in the way he did. But it’s the culture of these people, people who have never done a days work in their lives. I watched Brown last night acting as the thuggish unelected bully we know he is towards Adam Boulton. The wide eyed space case’s behaviour is another example of the desperate tactics this fag end government will resort to. Just like McBride and his ilk – lie and run people down even though a poor man has lost his disabled son. Draper, McBride – you can tell a man by the company he keeps. As I watched the empty conference hall on TV being filmed by the TV cameras from angles to make it look full I just had to laugh out loud. I have never seen a worse conference from any party – where was the debate? It’s over for Labour I fear unless we dump that loser of a leader and that will only be contemplated when we slip below the Lib Dems in the polls. Can we please stop moving the deckchairs and sort this mess out. Something we often forget on the left is that many of those in Eastern Europe were victims of an oppressive authoritarian communist regime. Thus there history of the left, particularly the Marxist-Leninist left, is not a pleasant one. Equally so capitalism has been just as brutal and democracy has proven to be a corruptable system in the ‘new’ democracies of Eastern Europe. It is no surprise therefore that some sections of the population in places such as Latvia, Lithuvania and other Eastern European countries see authoritarian right-wing populism (and at times fascism) as being an attractive alternative to the failures of both an oppressive communism and a corruptable capitalism. The left just needs to get a better grip of the cultral-political history of parts of Eastern Europe to understand fascist and extreme right-wing tendencies with populist appeals. Utter crap. Utter crap. Do not listen to what Phoney Blair and Co have to say about the Tories and Europe. But it doesn’t shock me that he’s been given coverage on LFF. Milibrand is an idiot! He is also a jew. Hence, his “outrage”! Earl, maybe you’d like to enlighten us on the issue of the Tories and Europe. McTavish, what has that got to do with anything? Right-thinking people of all religions will echo what the Foreign Secretary has to say. It is sickening that the Tories are jumping into bed with a bunch anti-Semitic, climate-change denying homophobes. Utterly, utterly sickening. All lumped into a package that the lefty Priests saw as Heretics. Prime for burning. Or like Stalin’s Peoples’ enemies. Prime for shooting. In world-record numbers. Supported by tiny, squeaking Western Turds who want to be part of Great Things. Let me suggest that Putin won’t reanimate any stinking Red Corpse. Gas or no Gas. The Carbon Priests dip out as well. The Peasants have some feel for the hoax, after the Priestly conbabblation in Copenhagen. They won’t pay. And the Chinese aren’t morons. Heroic Lefty Outspokeness gets reserved for societies with good media coverage of heroes and no chance of getting killed. Bogus story. Milliband is jewish and is apparently consorting with anti-semites. Who knows why?